Food Grade Aluminum Cup with Heat Resistant Silicone Handles. Textured Exterior, Leak-Proof Lock Top. 1 Liter Capacity, Priorities of Survival Guide. Size: 10 in. x 6 in. x 3 in., Weight: 12 1/2 oz. Steel Type: Food Grade Aluminum. Taking its inspiration from the classic military canteen and nesting cup, Bear Grylls and Gerber have updated the design with a BPA free water bottle, snug fitting nylon sheath and leak proof lock top. The two-handled cup is aluminum, suitable for boiling water. 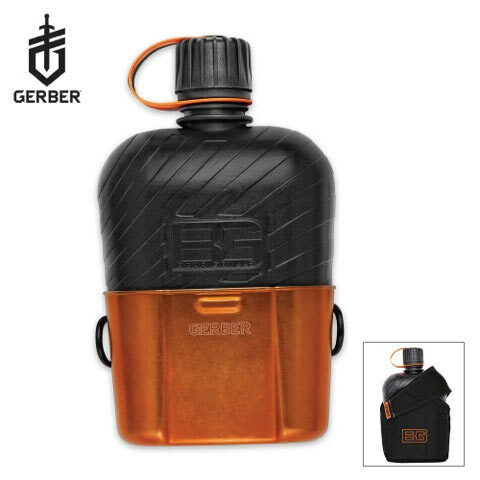 The outside of the canteen is textured to avoid spills or drops, even when you're wearing gloves or exposed to extreme conditions. For survival in the wild, a water bottle simply won't cut it.